I am halfway through a very long week (no, Thanksgiving isn't happening this year for me), but I am not missing a ManiMonday just yet! I didn't get a chance to do Thanksgiving-themed nails this year, but maybe next month I will think of something for American Thanksgiving! Maybe something with tryptophan? Today I am wearing metallic nails using the Born Pretty Metallic Nail Lacquer Mirror Effect Polishes* which is a finish I don't wear often because of exactly what you see here - it gets pretty streaky. As pretty as the colours were, I wasn't a huge fan of the patchy application on first coat and unforgivable nature of the polish consistency where every imperfection seemed magnified ten fold! I honestly don't know how people got such smooth finishes with their polishes because I really struggled. The gold shade "Dragon Knight" was the most patchy upon application with the pink, "Heroine", and blue "Icy Castle" being better upon the second coat. Even two coats of top coat didn't smooth out the finish so then I decided that it was time to try out my new interchangeable magnetic nail art charms! I picked up a couple of Born Pretty because I obviously needed 10 of them, but for this manicure, I whipped out a cute little white bow and a fluffy black flower. Each charm comes attached to a magnetic base which is anchored to the nail with glue or top coat. The base itself is fairly large and a design in itself. Once the base feels solid, go ahead and swap in your charm! They are COMPLETELY impractical, but are so ridiculous that I can't help but love them! These are just for show and really don't last very long, but they are certainly a talking point and a ton of fun to wear! Happy Thanksgiving everyone and I'm still going to be really busy this week, but I will have lots to share on social media! 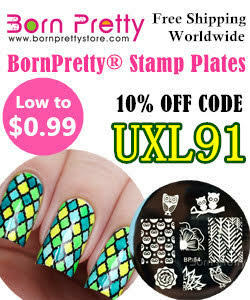 Be sure to use code UXL91 to save 10% on your order! HALLOWEEN | Here Comes the Bride of Frankenstein! HALLOWEEN | New Lush Goodies!